“Lockup” Director of Photography Brian Kelly (pictured left), and Field Producer Kaj Larsen (right), pre-interview Maricopa County Jail inmate Titus Fisher. Fisher is much better known by his rap moniker, Cuzzin’ Ice. Our crew captured Fisher and his cellmate Donnell Thompson, aka Dooker Loc, rapping together in their cell. But more importantly we told the story of their friendship-- one of a former gang member who has grown wiser with age and a young person who still revels in the gang scene. Maricopa County Jail inmate Donnell Thompson, aka, Dooker Loc, was a high school football star who could have had a bright future. But he told us he had no regrets about earning a name for himself-- not in a college stadium but as a member of the Crips street gang. When we shot our “Extended Stay” series at the Maricopa County Jail in Phoenix, we just couldn’t contain inmate Josh Pike. Pike is a mile-a-minute jokester who was always cracking up our crew in the middle of interviews. In “Raw” viewers get to feel our pain as we try to interview an inmate with a wicked sense of humor. We offer a little comic relief and also tell a poignant story of a young father dealing with drug addiction. When we shot at California’s famous San Quentin State Prison, we met a couple of amazing inmate artists. One of them was Joe Askey, a soulful country singer who practices right outside the entrance to Death Row. One of the thousands of inmates at Maricopa County Jail where most are awaiting trial or transfer to state prison. 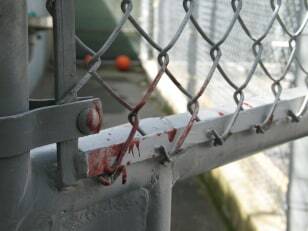 A reminder to inmates and staff that the rec yard at San Quentin or any prison can be a dangerous place. Cellblocks at San Quentin State Prison hold up to 800 inmates in cells that are stacked on tiers, five high. Officers have to climb a lot of stairs in this 160-year-old facility. “Lockup” Director of Photography Brian Kelly takes an over-the-shoulder shot of Maricopa County Jail inmate, Joe Watson. Watson is a former journalist with a gambling problem who turned to robbery to feed his habit. We catch him using his writing skills to create poems for other inmates to send to their loved ones. 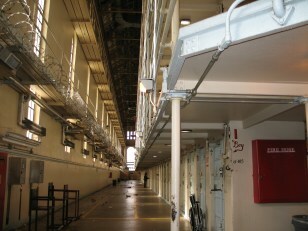 Phillip Kirkpatrick (pictured right) and George Mariscal at San Quentin State Prison. They share a cell but have very different feelings on gang involvement. When we met Rita Dziobecki at the Maricopa County Jail in Phoenix, we were immediately struck by her missing left eye. She told us about the shooting that left her injured. We got another take from her former housemate who was involved in the crime that led to the shooting. He’s also incarcerated at Maricopa. “Lockup” Director of Photography Brian Kelly takes a shot of Steve Robbins at Indiana State Prison. While serving 90 years for murder, Robbins spends much of his time creating beautiful oil paintings in his cell.